Edible Packaging? Retailers Not Quite Ready To Ditch The Wrapper : The Salt To reduce waste, some enterprising companies are trying to roll out products that make the package part of the snack — edible packaging. But selling it to the retail market is trickier than it seems. 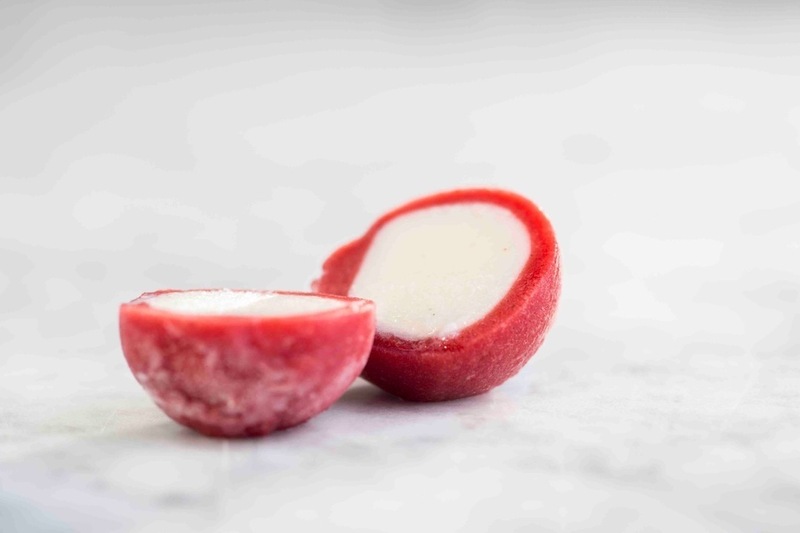 A strawberry vanilla WikiPearl made with Stonyfield frozen yogurt. A handful of companies are trying to take an idea straight out of Willy Wonka and turn it into reality: edible packaging. I mean, why dump tons of waste into landfills when the container your food comes in could be a part of the snack? One company called WikiFoods has taken inspiration from fruit to create a frozen yogurt ball surrounded by an edible skin. But marketing glitz aside, this product shows that duplicating nature is no easy feat. On opening day of the first Whole Foods store in Nashua, N.H., organic yogurt giant Stonyfield handed out free samples of a new frozen yogurt novelty produced for it by WikiFoods. bite-size frozen yogurt balls surrounded by a gel-like, edible skin made of fruit or coconut particles and a seaweed extract. It tastes sweet and it seems, well, just plain fun. Farrell joked, "If you had a function, this is a great end to a cookout — anything. Break out the little balls out here and have a ball!" 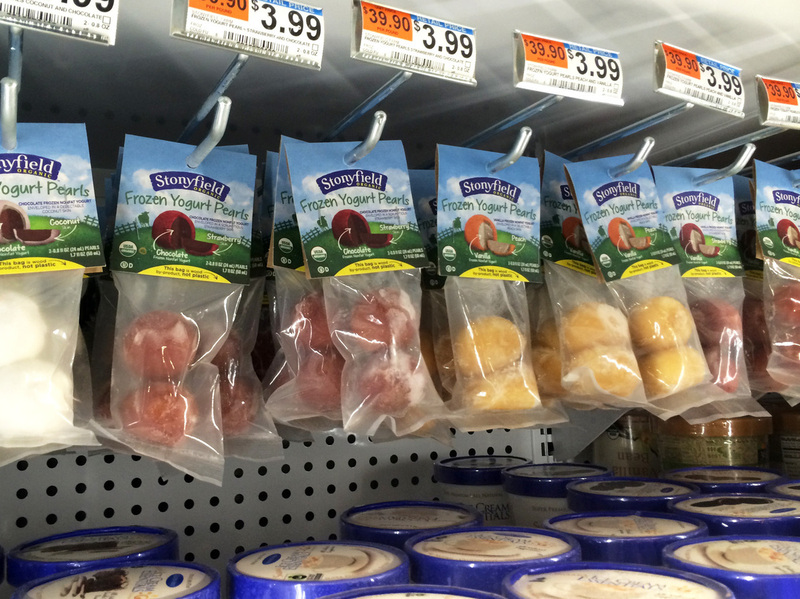 Plastic packages of WikiPearls made with Stonyfield frozen yogurt for sale at some Whole Foods. But it's more than a little ironic that when you walk inside the Nashua Whole Foods that you find the WikiPearls wrapped in plastic for sale, two yogurt balls per bag. "Conceptually, it is edible packaging," says Eric Freedman, the senior vice president of marketing at WikiFoods, which makes the skin for Stonyfield's pearls. "The product could be merchandised on shelves with no packaging and no plastics." He says in an ideal world, the pearls would be in a bulk food bin, and you would scoop them into your own little reusable container. Even though so far retailers have insisted on packaging, Freedman says he thinks consumers are ready to ditch the plastic. "We just need to find the right environment to introduce the product in its purest, purest form," he says. That environment could be more like a restaurant or at a buffet where you could serve them with tongs. Certainly that would ease the mind of consumers like Michael Bates. "Well, I think you have to be careful. ... I don't mind having a little bit of packaging because it makes the product hygienic, and safer," he says. The pearls are already offered at five Whole Foods stores in New England, and Freedman of WikiFoods says they are selling well, though he won't give any specific numbers. By the end of the month they'll be available in 35 Whole Foods in New York, New Jersey and Connecticut. So, how much of this talk of edible packaging is simply marketing? "The skins are melt-free and mess-free," Freedman says. "[T]hey do not need to be frozen." But when I let a couple of them thaw here in the studio, after 40 minutes, the filling started to ooze out of one, leaving a puddle of yogurt with what looked like a deflated jellyfish on top. Packaging industry consultant Sara Risch says that could be because frozen foods can partially thaw and refreeze as many as six times when traveling from the manufacturer to our freezers. "Where it may have been perfect if you kept it perfectly frozen, the moisture from inside the product can start basically degrading the barrier layer that they have," she says. Risch thinks there are reasons to be skeptical of the whole idea of edible packaging. The food that is already in its own skin — fresh fruits and vegetables — is the food that spoils most quickly. Risch worries that unless edible packaging can be refined to the point where it works as well as plastic, it might simply mean swapping throwing away plastic for throwing away more rotting food. So for now, just like pierogis and dumplings, WikiPearls are restricted to the freezer aisle, in a bag. But you can look beyond the grocery store to find these treats. WikiFoods will soon be available at Cafe ArtScience in Cambridge, Mass., where soups, cocktails and more will be wrapped in edible skins. Or you can always hop a plane to hit the WikiBar outside the Louvre in Paris.